Pure Aloe Vera juice. 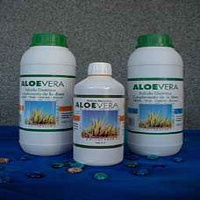 Food supplement based Aloe Vera Juice 99.8% obtained from the inner leaf gel of Aloe Vera. Nutritivo.Modo polysaccharides containing high value to use: Take 5 tablespoons daily. 5 tablespoons daily contribute 49.9 ml Aloe juice. Do not exceed the daily dose.